I don’t see any reference photos of what we’ll be painting in class. How do I know what we’ll be painting? I haven’t held a paint brush since grammar school – will I be able to keep up in class? Do I need to reserve a seat for a class? When does the monthly calendar get posted? Blackbird is a BYO. What am I allowed to bring? 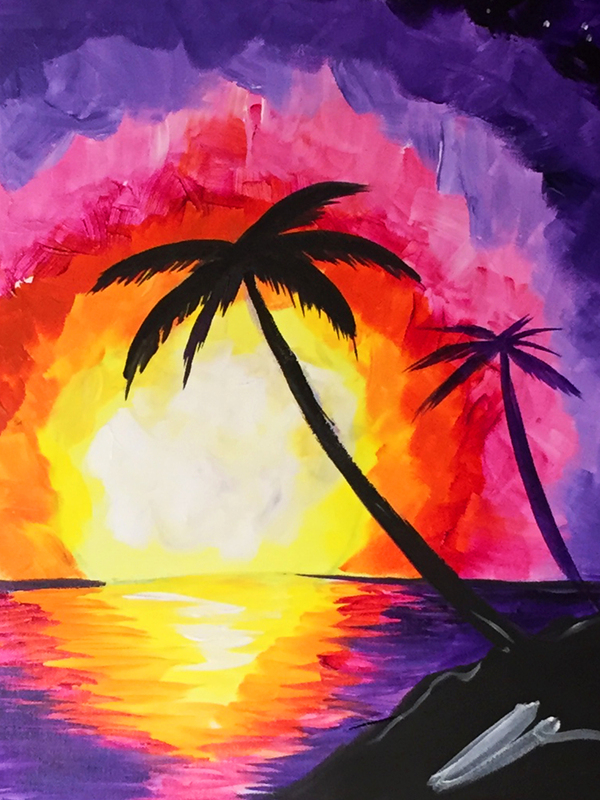 What is the age limit for regularly scheduled Paint & Sip classes? Am I allowed to bring snacks to class? Do you offer classes for children? Are they allowed to join regularly scheduled classes when accompanied by an adult? Do you require a minimum number of people to host a scheduled class? Great question! With the exception of special events and themed classes, we don’t announce what painting you’ll be working on prior to class. We have a very organic approach to painting at Blackbird. We don’t want you to make a carbon copy of another picture. Our head artist will guide you through a step-by-step instruction from blank canvas to finished product – but we also want to encourage your creativity too! We want your painting to be as unique and individual as you are! YES!!! We encourage everyone to participate in our classes, from beginner to expert. Most of our Paint & Sip guests are coming in and painting for their first time! Our head artist will guide you during the class and provide additional help as needed. Our goal is to provide a fun and relaxing experience to guests of all levels. We highly recommend that you make reservations! Classes tend to book up quickly - we’d hate for you to walk in and we don’t have any spots left. A reservation is the best way to ensure you and your guests have seats on the night of your choosing! Awesome! We’d love to have you join us! You can view our calendar of available classes under the section titled “SCHEDULE”. Please select the date and time that works best for you! Once you have selected your class, click on it, and you will be directed to our reservation page. Simply fill in the prompted questions to make your reservation! If you have any questions or trouble booking please give us a call! Pull up Groupon with our mobile app (or print it out). Click "Redeem Voucher" and enter the redemption code found in the middle of your Groupon (if you have a numeric barcode, do not include the dash), and click "Apply". Select desired class and number of tickets. If you are still experiencing issues please contact Groupon's customer support team for assistance with properly downloading your Groupon voucher. They can be reached by calling 877-788-7858 or by emailing support@groupon.com. Full refunds are available if you cancel 48 hours prior to your reservation. You may also choose to transfer your reservation to another date within 48 hours notice. * Any and all cancellations that are made within the 48 hour window will be charged in full, no refunds. All no shows will be charged in full, no refunds or rescheduling. All of our classes will begin at their specified times. We kindly request that you arrive 15 minutes prior to your class time to get checked in and settled. We will do our best to catch you up! If you are more than 30 minutes late it can be difficult to bring you up to speed - especially on evenings when we only have one instructor leading the class. 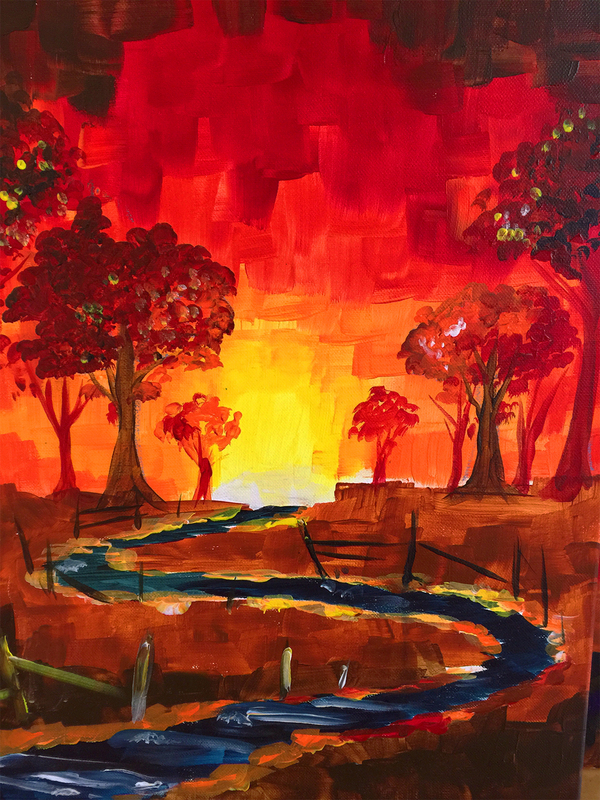 In this case you are still welcome to sit in on the class and paint, however we may not be able to provide you the same step by step instruction that the rest of the class received up to that point. We typically post the calendar for the upcoming month by the 3rd Sunday of the current month. Generally speaking, we host a class every Friday and Saturday evening and we have special events and themed classes on selected dates each month. There is no set dress code - come dressed up or dressed down! Please be aware that art can be messy! Blackbird Gallery is not responsible for any damage – so if you’re worried about ruining a favorite something, it might be a good idea to save it for another evening or for after class. We are a BYO location which means you are welcome to bring your favorite bottle of wine, champagne or beer. We do not provide or sell alcohol. In accordance with NJ state laws we are not permitted to allow any hard alcohol or liqueurs in the gallery. We provide wine glasses and corkscrews to help you enjoy your beverages! We also have a small mini fridge to keep your beers and whites cold! For our Paint & Sip classes on Friday and Saturday evenings we require guests to be 21 and older. All guests who would like to drink must be 21+ and we will request to see your ID if you plan on consuming alcoholic beverages. No! Unless specified – let me explain! We provide all of the materials you will need for the classes, such as the Paint & Sip and the Pentel Brush Class. For our other course options, like the Photo 101, you are encouraged to bring your own camera to learn on (although we do have a few you can rent!). Yes, we offer certain classes that are geared specifically toward children and young adults – these classes alternate and fall on select dates each month. We also allow children (10+) and young adults to join most of the special event and themed classes during the afternoons. Children’s classes and special event classes fall on selected dates each month. You can find them on our calendar of events and on our instgram page @BlackbirdGalleryJC. We would love to host your event! Regardless of the occasion – birthdays of all ages, baby showers, bachelorette parties, corporate team building, holiday parties – we would be happy to make this a memorable experience for you and your guests! Hosting a private event allows you the luxury of having the gallery exclusively to yourself and the opportunity to select the theme of the painting. If you would like to learn more about having a private party at the gallery please give us a call! Occasionally, we have an irregular night where not many guests sign up. We will host a class as long as eight spaces are reserved. In the event we cancel class, we will notify you as soon as possible and also be as accommodating as possible in helping you find a new date to join us!